Capital Land – Head & Shoulders Pattern Failure! Capital Land had a Head & Shoulders pattern failure and have almost reached the target price of $4.40. Capital Land will probably have a correction to retest the $4.12 resistance turned support line. This stock has the potential to go up to $4.686 if this support level can be hold. Synear – In consolidation phase now! 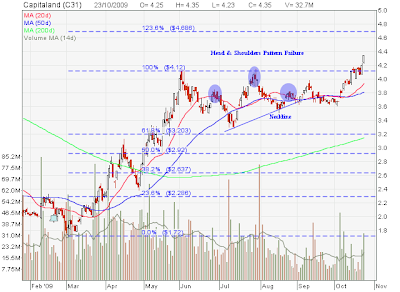 GoldenAgri – Trend Reversal Pattern Spotted!